Comm Eye Health Vol. 20 No. 62 2007 pp 30 - 31. Published online 01 June 2007. Children who are blind need to be found as early as possible so they can be examined, treated, referred, or rehabilitated. This is crucial if they are to have the best possible chance of proper childhood development, education, and participation in broader social life. This method can fulfill two very important roles: providing data on the frequency and causes of blindness in children in the community, and finding a large number of children who need services, whether clinical, educational, or rehabilitative. The method involves using volunteers who know their community well, whether through their occupational or social roles, in order to identify children who are blind. These volunteers, called key informants, can be health workers, school teachers, non-governmental organisation (NGO) staff, government staff, religious leaders (imams, church leaders, etc. ), traditional healers, local journalists, or other people who are actively involved in the social network of the community. Ideal key informants should be reliable and willing to contribute their time voluntarily. They should also have the opportunity, through their role in the community, to disseminate information to a large number of community members, either directly or indirectly. Although key informants are volunteers, they need to be motivated and mobilised with a specific objective: in this case, to find blind children. This is the responsibility of the member of the project team known as the community mobiliser. The community mobiliser stays and works in a defined community for the duration of the project (approximately six weeks) to identify, train, motivate, and mobilise the key informants. The success of the key informant method relies heavily on the networking, social and communication skills, motivation, and commitment of the community mobiliser. The method works best when it is conducted in a relatively small, defined geographic or administrative area, ideally a sub-district with a total population of 100,000 to 250,000. Larger areas can be covered through a phased approach or by using a larger number of community mobilisers. The physical size of the sub-district and the local transport and communication infrastructure should also be taken into account: a community mobiliser should ideally be able to visit every corner of the sub-district several times during the six weeks he or she will spend there. During such a six-week period, one community mobiliser, working with 40 key informants who he or she has trained, should be able to identify 60–80 blind children. One community mobiliser can cover eight sub-districts in a year and identify 500 to 600 blind children from a total population of 1–1.5 million. The following steps are implemented, one after the other, over a period of six weeks, as shown in the timeline in Table 1. Mapping social networks: The community mobiliser identifies possible groups through whom key informants could be recruited, e.g. local organisations, development, education, or health NGOs, government departments, schools, disability-related projects, women’s groups, and other relevant individuals and organisations. A start can be made on this before visiting the community. Networking and sensitisation: The community mobiliser holds one or more half-day ‘sensitisation’ meetings with representatives of the agencies, organisations, or groups identified, in order to explain the reasons for finding children who are blind. Groups are asked to suggest suitable key informants. Organising a local group of key informants: After sensitisation, key informants may decide to divide the sub-district into four or five smaller segments (each with a population of 50,000), depending on where they live and/or work, as well as on the local transport systems. Each segment can be covered by five to ten key informants, ideally from a mix of different groups or organisations. This is done in order to avoid duplication and to ensure intensive coverage of the population. Key informant training: Once the segments are agreed, the community mobiliser trains key informants in groups of up to 20. The sessions last half a day and key informants are taught how to find blind children in their local community. Training includes an explanation of blindness and its causes in children; emphasis of the fact that many blind children can benefit from treatment, education, and other services; and assessment of vision. ‘Counting fingers’ at three metres is used for children aged 6 to 15. In order to ensure that pre-school children are not missed, key informants are trained to refer a child for examination if the mother thinks there is an eye or vision problem. The key informants are also encouraged to network over the following three to four weeks in order to identify children thought to be blind or to have ‘serious visual problems’. They may work in pairs or small groups to encourage and support each other. Health communication and case finding: Key informants are responsible for two tasks over the following three to four weeks.The primary task is to spread the message (often through their social and/or occupational role) that case detection of children who are blind is taking place in the sub-district, and to encourage community members and parents to report to them the name of any child who is blind. The second task is to identify children who they think are blind and to make a list of their names, ages, and addresses so that they can be examined by the visiting eye team on the eye examination day. Supporting key informant activities: While key informants are networking in the community, the community mobiliser’s main task is to provide continuous support and encouragement, for example by visiting each key informant to discuss progress, visiting households with blind children together with the key informants, conducting community level meetings on the issue of childhood blindness, distributing posters and leaflets in public gatherings, and attending various community meetings. Planning and organising the eye examination day: The community mobiliser is responsible for organising the date and venue for eye examinations. Key informants then tell all parents and carers of identified children where and when children should attend to be examined by the visiting eye team. In cases of significant poverty or distance from the eye examination site, parents may need to be provided with transport or to have their transport paid for by the project. Eye examination day: On this day, the visiting eye team (which includes one or two ophthalmologists) examines all the children identified by the key informants, confirms whether these children are blind, determines and documents the cause(s) of blindness, and refers children who need services. The eye team also gives feedback to the key informants. Referral and follow-up: Specific referrals should be made for children who require medical, optical, orsurgical interventions. Children should also be referred for inclusive education, early intervention, low vision, and social services. A list of all referrals should be drawn up by the community mobiliser in consultation with an ophthalmologist; this is to allow the community mobiliser to follow up attendance both with the family and with service providers. The community mobiliser should ensure that services are available and accessible to all referred children. Simple but locally appropriate training and communication materials can contribute to the success of the key informant method. 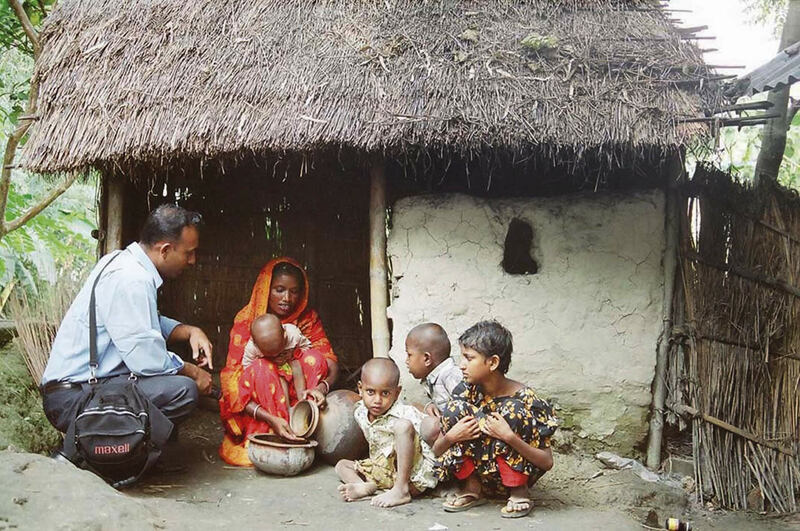 In Bangladesh, a standard training manual for the community mobiliser and a flipchart (flipbook) for key informant training has been developed in the local language, Bangla (an English version is available from the author). 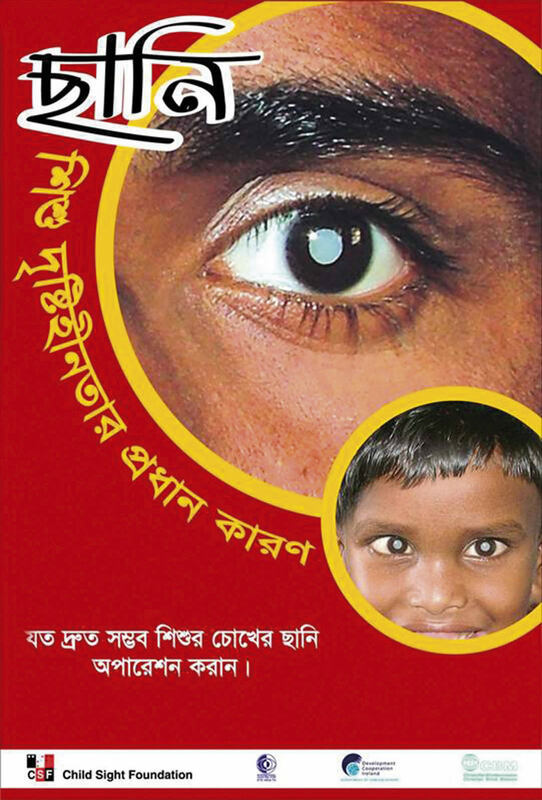 Simple, colourful posters (Figure 1) can be distributed by key informants at community level to increase community awareness about childhood blindness and to increase the reporting of children who are blind. Local radio and television can be used to announce activities. Small leaflets can be distributed in large quantities during public gatherings: this is a low-cost, but effective, means of mass communication. 2 Boye J. Validating key informant method in detecting blind children in Ghana. J Comm Eye Health 2005;18(56) 131. 3 Kalua K. Use of key informants in determining the magnitude and causes of childhood blindness in Chikwawa district, southern Malawi. J Comm Eye Health 2007;20(61) 8.